Everyone, in one way or another, relies on clothing every day. Clothing is essential to keeping us warm and protecting us from the elements. Yet, ill-fitting clothing or having no clothes at all can cause great hardship beyond exposure to the elements—it can hurt self-image and reduce ones chances of getting ahead. A poorly dressed person has little chance for success during a job interview and can be functionally barred from certain spaces in the city. To help mitigate the negative impacts of homelessness, social entrepreneurs around the world are promoting creative solutions to help clothe the homeless through urban pop-up clothing shops. In addition to improving social conditions, these shops inspire positive environmental impacts through the reduction of waste. One successful urban clothing pop-up that’s inspired similar models around the world is the Street Store in Cape Town, South Africa. Cape Town’s homeless population has few opportunities to acquire low-cost clothing. 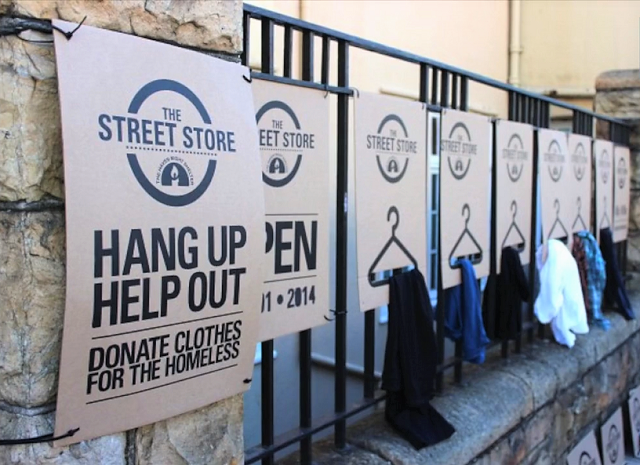 To help solve this problem, the Street Store was created in 2014 by the Haven Night Shelter Welfare Organization and M&C Saatchi Abel. The concept is simple, yet its impacts are great. The pop-up shop is setup one day every few weeks or months and is designed for those with low or no income. All the clothes are free. To gather donations, the company promotes the event on social media, including on Twitter and Facebook. On the day of the event, cardboard signs with painted hangers line the sidewalks, letting people know what’s available and encouraging gifts. Donors drop off contributions and volunteers help organize the clothes by size and style. Patrons can visit and collect quality items for job interviews, work and everyday wear. Additionally, the Street Store’s reuse of clothing drastically expands the lifetime of each item. Reusing clothing reduces carbon dioxide emissions and waste, improving environmental sustainability. 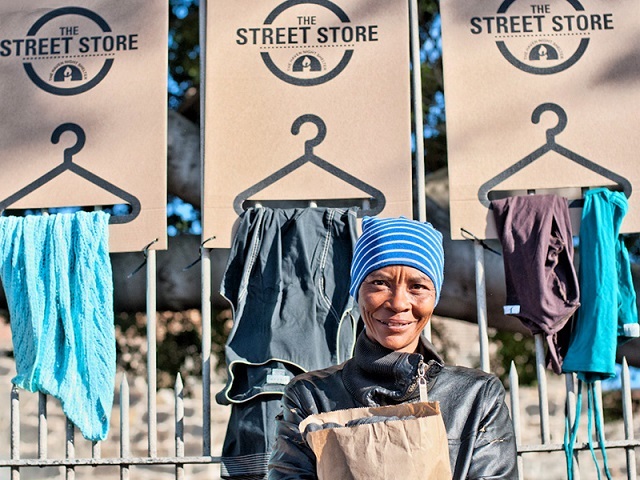 The success of Cape Town’s Street Store has inspired similar efforts around the world. 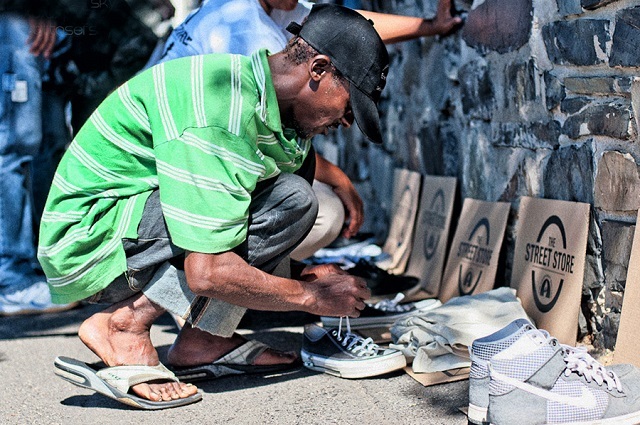 The Street Store partnership provides open-source materials at no cost to social entrepreneurs. Today, more than 580 Street Stores have occurred globally across five continents. Similar to the Cape Town store, the San Francisco pop-up is committed to promoting a more equitable city. They strive to pass on high-quality donations to the homeless, rather than items people don’t need or want. More Street Stores are coming to a variety of cities, including Rio de Janeiro (Brazil), Hasselt (Belgium) and Americana (Brazil). As the network grows, so will the empowerment of the urban homeless around the world. Lori O’Neill is an intern for WRI Ross Center for Sustainable Cities’ Building Efficiency Initiative.